S (Scripture): Acts 16:30 Then the jailer brought Paul & Silas outside and asked, “Sirs, what must I do to be saved?” 16:31 They replied, “Believe in the Lord Jesus and you will be saved, you and your household.” 16:32 Then they spoke the word of the Lord to him, along with all those who were in his house. O (Observation): The shock of the situation has subsided. The force with which God shook the jail and freed Paul & Silas has come and gone. Now, outside of the jail, the jailer starts to believe that this is indeed God’s holy work, and wants to show his belief in God. 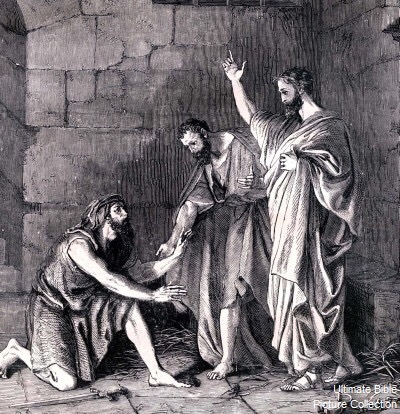 As a result, the jailer is baptized and his household receives Paul & Silas, to be able to hear the Word of the Lord. A (Application): A subtle note carries me deep into this story: Paul & Silas spoke the Word of the Lord to the jailer’s household. A household in that time was not just a nuclear family. Rather, one family could have many relatives and close friends living in the same cluster of homes – around 20-40 people…think extended family. And this was part of the key for Paul. The Lord would provide for Paul a person of peace – one whose heart the Lord had prepared to receive the Word. Once Paul entered a relationship with this person of peace, that person would then be a gateway to sharing the Word of the Lord with others. Instead of trying to do mission through welcoming people to worship (a foreign experience for the non-churched crowd), and waiting for people to come to us, perhaps we can seek wisdom from Paul and his method. Seek a person of peace, share the Word of the Lord with that person, and see how that person can be a gateway to a household, or a group of some sort. Which persons of peace have you encountered lately? Have you seen fruitfulness in sharing God’s love with that person? Has that ever led to sharing God’s love with others? Remember, God is out in front of us…preparing people’s hearts and minds to receive the Word that we can share with them. Be encouraged! P (Prayer): Lord, you care for us deeply and you lead the way. Help us to follow you (and trust you), so that we can go out to encounter the person of peace in our world. Amen. This entry was posted in Digging Daily and tagged Household, Jailer, Paul, Peace, Person, Silas. Bookmark the permalink.